Card games for one player date back to the existence of cards themselves; that fact alone attesting to the deep-rooted tradition of filling downtime with meaningless activity. Solitaire, along with other genteel pastimes, served adequately for generations. However, the twentieth century phosphoresced with electronic venues that brought wasting time to a new zenith. By the millenium’s eve, media networks had primed the world for the next higher plane: watching other people survive meaningless activity. 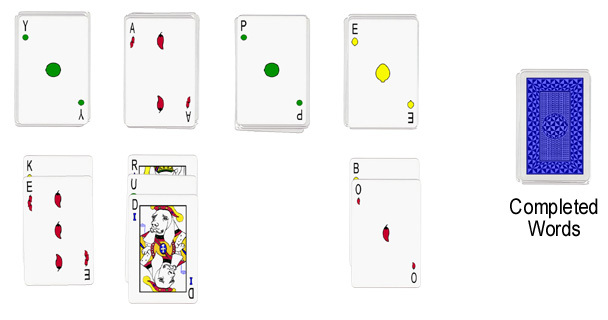 About the same time in history emerged this simple card game Scrolitaire. Arguably more colorful and slightly more compact than its traditional card predecessor, Scrolitaire may very well become the next overnight sensation. Currently, a modest following has come from the ranks of business travelers who are enjoying the first solo card game played comfortably on an airline tray-table, still leaving room for a plastic cup and miniature bag of pretzels. But the standards by which quality and value are judged are at levels never before encountered. Experts agree, whether Scrolitaire merely fizzles or erupts to cult status remains squarely in the palms of adolescents with unchecked discretionary income.